"Katten gejammer", the sound cats make when it's that time of the year. Would Katzenjammer translate into this from Norwegian? Interesting. In nothing the four Norwegian ladies can be accused of "katten gejammer". They sing like angels instead. What a beautiful record this is. Things American have found their way into the Nordic country that faces the storms of the northern Atlantic and the wintry colds. The foursome is from the rather sheltered and southern Oslo. That may explain the tendency to play and sing Appalachian and more southern kind of U.S. music. Katzenjammer is Anne Marit Bergheim, Marianne Sveen, Solveig Heilo and Turid Jørgensen. They play whatever is available and change instruments when a song calls for it. The ladies play together since 2005 and released four albums since 2008. Rockland being #4. 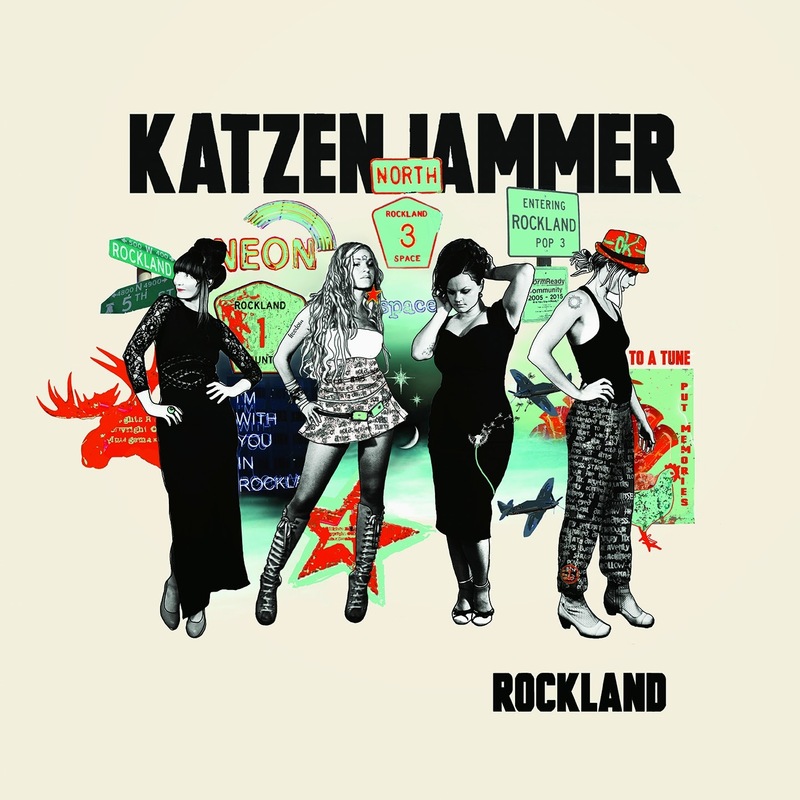 Katzenjammer knows how to blend tradition with modern influences and allows in any effect if it raises the atmosphere. In 'Oh my God' some hip hop is allowed in, but is mixed with a French chanson accordion and a mandoline from other exotic pastures. The start of the album is more traditional though. 'Old the Spain' is traditional Americana, close to alt.country and 'Curvasious needs' is a song that can go on Karen Jonas' debut album without a frown spent on the choice. By song four and the fourth drastic mood change, my mood on Rockland changes a bit also. This little girl romantic pop song with a ukulele or something, strays far from what I heard before and is not for me, being a grown up guy with some mileage on the display. So where do we go from here? To another mood change of course. 'My own tune' is a more alternative Americana song. Again with a poppy vocal melody. Nordic exuberance and some Nordic singing followed by a child's piano. The kind of song that I can imagine being sung on the Midsummernight fest in a Norwegian wood far off from the mundane world. The ladies singing around the bonfire. By the time 'Shine like neon rays', again with that funny piano, comes in, it became apparent to me that Rockland isn't an Americana album at all. Again this is a joyful pop song with happy smiles all over the place. It remembers me a lot of the songs on Veruca Salt's album 'Eight arms to hold you'. The same sort of singing, the same sort of great pop tune, with a completely different instrumentation. 'Shine like neon rays' works totally and as far as I'm concerned one of the best songs on Rockland. 'Driving after you' is a ballad. A darker, brooding song that is led on by a piano. A real one. The singing is close to Anouk, so 'Driving after you' could become a hit here in NL. Another song I like by the way. It holds some of the classic, epic balladry, that seems to lift a song up to another level. Making it larger than it is in reality. This level is kept up with the poppy refrain of 'Flash in the dark'. By then I have to ask myself whether the perceived dip in Rockland comes from my expectation of this record set by the first two songs on the album or the quality of those songs? Listening again to the quality of the songs starting at song 6, I tend to go for the latter, although a part remains the abrupt change. 'Flash in the dark' is on a high level though. 'My dear' is a light and poppy Americana song. In the chorus traditional U.K. folk pops up its head. Steeleye Span e.g. The Americana returns with 'Bad girl'. 'Rockland' is a small song that ends this adventure as that is what Rockland is. With some Paul McCartney style ooohhs in the harmonising as well. Concluding it is safe to say that I like Rockland. The adventurous playing, instrumentation and the harmonies the ladies sing and the melodies they've found for their tunes. It is also safe to say that Rockland is almost too adventurous, containing too many styles, that could put off someone with less stamina than I. So there is the message coming with this review: Keep on listening. The rewards are worth it.